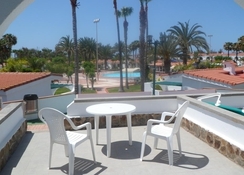 The Duna Beach Bungalows are set within a peaceful area of Maspalomas on the southern coast of Gran Canaria, approximately 1km from the sandy beach. 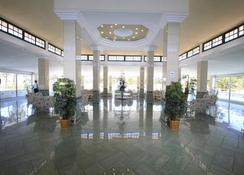 The relaxing resort center with its selection of shops, bars and restaurants is also 2km from the Duna Beach Bungalows. Maspalomas is close to the lively resort of Playa del Ingles where you can head for a late night of dancing on your holidays to Gran Canaria. 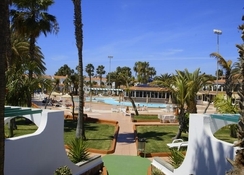 A holiday at the Duna Beach Bungalows is the right choice for families and couples looking for cheap holidays to Gran Canaria with flexible accommodation within easy reach of the beach, the resort centre and the golf courses in the area. The Duna Beach Bungalows are located close to a golf course where you can practice your swing and improve your handicap. Why not head to the lush sandy beach and try some of the water sports on offer, including wind surfing, jet skiing, sailing and body boarding or you could just laze on the soft golden sands and soak up the sunshine on your holiday at the Duna Beach Bungalows in Gran Canaria. You could check out the promenade and stroll around the shops or stop off at one of the restaurants for a bite to eat on your holidays. Maspalomas is within easy reach of the bustling resort of Playa del Ingles, where you can dip your toes in the action-packed nightlife. Duna Beach Bungalows consists of 132 modern bungalows, each with a terrace/garden area, bedroom and living-kitchen area with satellite TV. 1 bedroom apartments will have 2 or 3 beds. All have a balcony or terrace, private bathroom with shower as well as a kitchenette and satellite TV. The Duna Beach Bungalows’ buffet restaurant offers great local and international cuisine. The hotel also has a Palm Bakery Café and a delightful bar that serves refreshing drinks around the poolside. 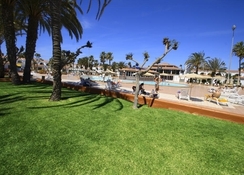 Central Maspalomas is only a couple of kilometres away and it has an array of bars and restaurants to choose from. 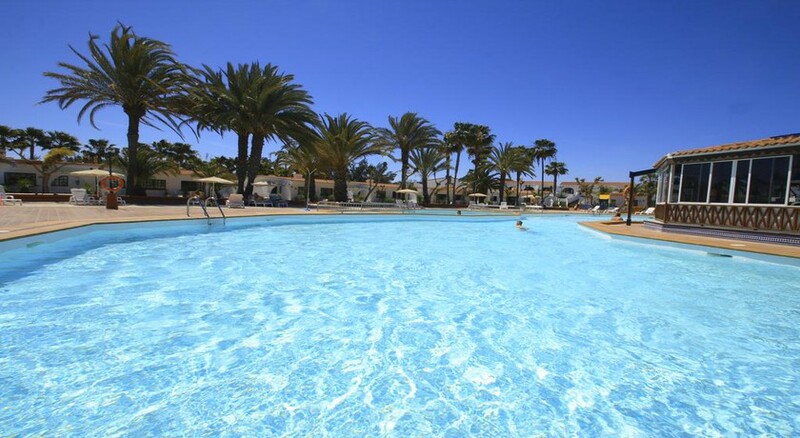 You will find an outdoor pool, heated pool, children’s playground, pool table, tennis court, table tennis and a supermarket at the The Duna Beach Bungalows. If you want something livelier then head to Playa del Ingles for a lively night out dancing till the early hours on your Maspalomas holidays. Those on their family holidays to Gran Canaria will enjoy the water parks, excursions, boat trips and a good range of activities everyone will enjoy. If you’re after a fun day out with the kids on your holidays to Maspalomas, visit the Holiday World Amusement Park and ride on the roller coasters or watch the sea lion show. Why not visit the Ocean Park Water Park or try a camel ride across the sand dunes; for some non-beach activities, there are facilities for tennis, paragliding or rock climbing. The shopaholics will be pleased to know that the island holds a duty-free status, meaning you can pick up some great bargains to take home with you. Great for us to be able to sunbath in own area , pool ok there were works going on but to be expected in September. It's a little out of the town and a taxi or bus ride, the large supermarket is around 20mins walk, small one up the road to the right. All reasonably priced. There are bars and food places near the large supermarket nice places to eat. Las Malomas is a great night out in the town, a must see is the drag bars there amazing. Food here is excellent from the bar at lunch time, but I'd keep away from buffet.